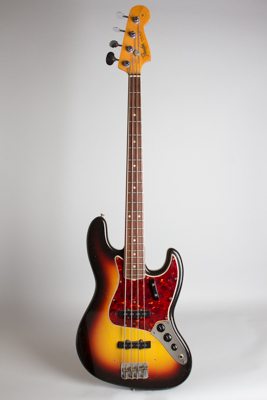 Fender Jazz Bass Model Solid Body Electric Bass Guitar (1966), made in Fullerton, California, serial # 139188, sunburst lacquer finish, alder body, maple neck with rosewood fingerboard, gig bag case. This is an excellent example of an early-CBS era Jazz bass, lightly played but all original and generally very well-preserved. It features typical transitional features-a pearl dot rosewood fingerboard with the binding that appeared in 1965, transition gold logo decal, and the unusual Fender-made "egg button" tuners particular to Jazz basses of this period. The body is finished in a vibrant 3-tone sunburst lacquer finish with a tortoise plastic pickguard. The neck is dated APR 66 and the pots are from the 18th week of that year. This is a medium-light weight Fender bass, extremely resonant, an excellent player with a somewhat more low/midrange tone than many typical '65's and 66's, which tend to be very bright. Overall length is 46 1/2 in. (118.1 cm. ), 14 in. (35.6 cm.) wide at lower bout, and 1 5/8 in. (4.1 cm.) in depth, measured at side of rim. Scale length is 34 in. (864 mm.). Width of nut is 1 1/2 in. (38 mm.). This bass is all original with some light average finish wear; it is complete except the chrome bridge cover and handrest are missing. There is some wear through the finish between the bridge pickup and volume control; the rest of the face has some scuffing but no major dings or chips. The back has one decent sized area of vinyl strap burn into but not through the finish, again some scuffing but no major chips, dings or scrapes. There is one small screw hole crack in the ege of the pickguard by the controls. The neck is excellent with some light wear through the finish on the treble edge, and checking to the headstock face. Playability is excellent-the original frets have only some light wear. A very nice example of an early CBS Jazz bass. Excellent - Condition. This item is currently on hold.